How Do We Really Forecast the Future? QUESTION: Mr. Armstrong; It is obvious that you have indeed been behind the curtain for your knowledge of even global politics is amazing. Kim Jong Un is here in Beijing. You said he would back down. You said the risk of war lies in the Middle East, not Korea. Your model calls the markets. You said the Dow would bounce for two days and then turn down. Even that took place today. Where do you begin and the computer ends? ANSWER: That is a hard question to answer. The computer can show me the region for conflict. That is determined by cyclical trends for each region yet at times it is augmented by a combination of capital flows. 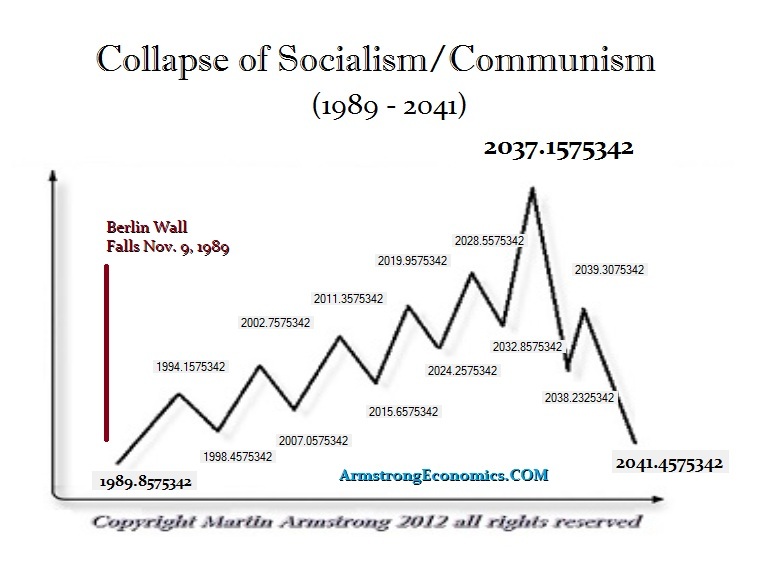 Picking things like the fall of communism back in 1989 and picking when the Berlin Wall would fall were based cyclically on the outcome of that trend. That was 72 years from the Russian Revolution of 1917. 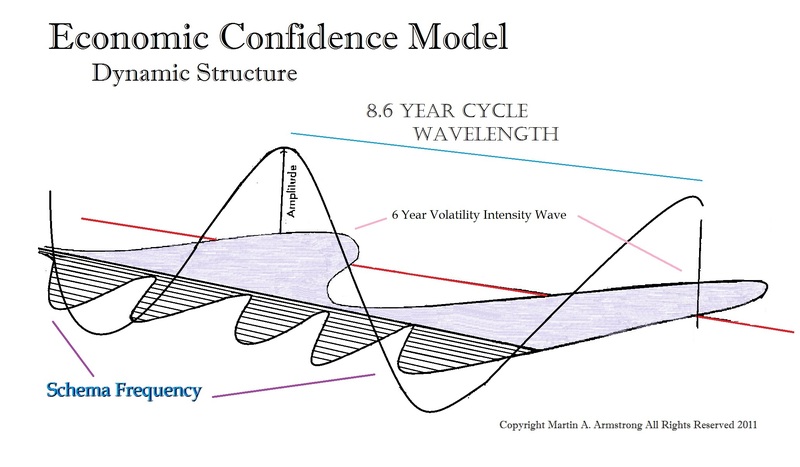 That was the perfect target for the volatility models within the ECM. Both converged so it made it really a piece of cake. 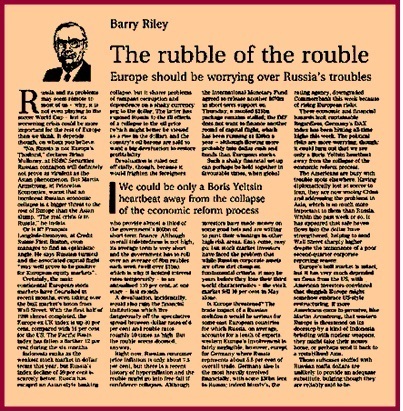 The collapse of the Soviet Union came in 1991, that was a simple 2-year reactionary process all within a cyclical forecast. Now, the collapse of the Russian bond market which set in motion a major contagion and the Long-Term Capital Management debacle was determined from a capital flow and cyclical perspective. That came 8.6 years following the fall of the Berlin Wall. When that forecast made the front page of the second section of the FT, that is when even the CIA came. They suddenly realized that our model could forecast the rise and fall of nations. But that is also when the bankers began to complain to the CFTC and SEC that I was “manipulating” the world economy because they were all long Russian bonds and blamed me for their losses using the FT article as proof. They said I had too much “influence” rather than consider the possibility that just maybe we were able to forecast events that they thought bribing politicians would prevent. The above chart is calculated from the day the Berlin Wall fell – November 9th, 1989. Our forecast for the fall of the Russian financial system in 1998 was 8.6 years from the fall of the Berlin Wall. But look at the dates beyond that 2002 (low in the US market post-DOT.COM Bubble), 2007 (the peak in the world economy & start of real estate meltdown), 2015 (Russia invades Syria, Refugees welcomed into Europe by Merkel, start of the rise in interest rates at the Fed), and the dates to come are 2019, 2024, 2028, and 2037. This is the collapse of socialism is the collapse of pensions and will result in a new monetary system. We will see 2019 as a financial crisis and 2024 as a rise in commodity prices. Each domino is set in motion by the previous. Yes, my experience behind the curtain allows me to understand the real risks, but the model defines where they are and the computer will continue to write reports when I am gone. Kim Jong Un made a big show because if he DID NOT, he would be overthrown. Someone in that position always needs an external enemy to blame for the starvation of his own people. Now that he has played that hand of cards, he is still at risk of being overthrown. Now he needs to talk to lift restrictions to appease his people or he is still at risk of being overthrown. « If Computers Replaced Politicians – Could it Get Any Worse?